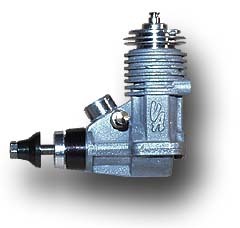 This small engine comes from Russia and has a brass cylinder with an integral, chromed liner. 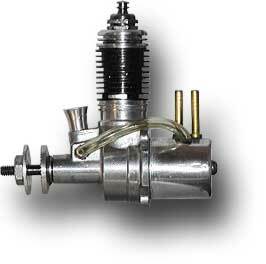 With its Schnürle porting, it was a good performer, available with a glow or a Diesel head. Its production has been superceded by the Stels engine shown below. (I am not sure whether this story is correct - all these small engines from St. Petersburg are somewhat confusing). This is the first production version of the VA .049 engine, featuring a unique, horizontally split crankcase. 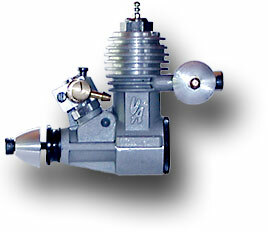 The engine was developed for free flight and control line contest models. The development by Valentin Aloshkin in St. Petersburg was initiated by Dan Rutherford. The crankcase is held together by a tiny screw on the bottom rear and the black collar behind the drive washer. The piston, running in the nickel plated casing, is also something special, as it consists of a smaller center piston with a «screw on» outer piston. Thus it is possible to adjust the timing by placing shims between the two piston parts. A standard Cox glow head is used and the nicely machined exhaust port flange is tempting me to build a small tuned pipe for this engine... Other samples of this engine are equipped with a head for a standard glow plug. This is the revised version of the VA .049 engine, now with a conventional crankcase. This sample came equipped a nice R/C carburetor and a muffler. The head consist of a button held in place by a screw on retainer ring. It accepts Nelson glow plugs. The transfer ports have been machined into the chromed brass sleeve, which therefore is very thin in these areas. The wrist pin is contained within a screw in carrier so that the piston has a closed outer surface. Finally the crankshaft with its generous bore has a balanced counterweight. All these measures make the engine good for high performance. 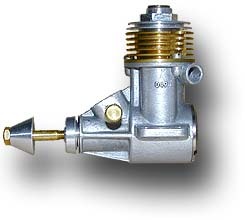 The small carburetor has an adjustable stop and an adjustable bleed air hole for low idle speed. 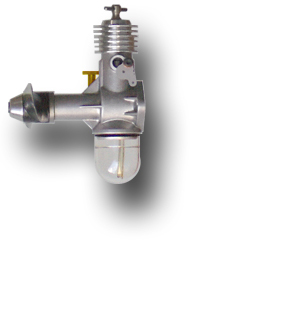 Pressure taps are available on the muffler as well as in the knurled backplate. This is one from a series of very similar small engines from Russia. It is manufactured in St. Petersburg and the original documentation calls it "Aero-0,8" (Aero-0,8). The company logo seems to be a capital V. The power is said to be 125 W at 21'000 rpm and the sectional drawing shows the engine with a high performance glow head. The actual engine came with a poor standard glow plug which is screwed into a well designed head. 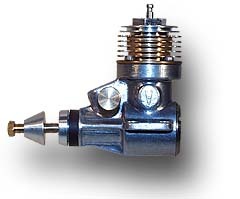 This head contains a combustion cone and only a small opening in the center connects to the glow plug. The glow plug must have a flat face to fit the head tightly. The English translation calls it "AME-0.8" and states a power of 175 W at 25'000 rpm. The data sheet even notes a value for the fuel consumption of 0.25 kg/h. Another small engine, manufactured in Russia. The basic design is similar to the AME .049 above and you can compare it also with the Norvel engine depicted below. The similarity is probably no coincidence, the main differences are the carburetor and the additional muffler of the Norvel. 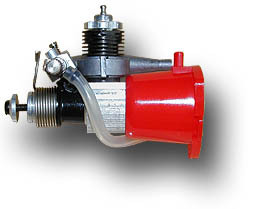 A similar plastic carburetor insert is also available for the AME .049 shown above to improve fuel feed when no pressurized tank is used. This .049 comes with a diesel head and unique twin rear exhaust stacks, also called "two horn". It has the same chromed brass cylinder as his glow siblings. The Stels engines were produced by Alexander Guevski in St. Petersburg. These nice little engines from Russia represent the state of the art in engine design, with piston and sleeve in ABC technique as well as Schnürle porting. Quality and price seem to be o.k. and we'll see what they can achieve in the long term. Another engine «Made in China» but probably not suited for the everyday user. 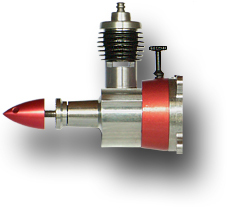 This is a really hot racing engine for small control line speed models. It is intended to be mounted on an aluminum speed pan and to drive a single bladed carbon fiber propeller. Due to the long exhaust timing, the engine relies on the nice tuned pipe to run properly. ~ 176° The transfer ports are slightly asymmetric causing the timing to vary by ca. 3° from left to right port. 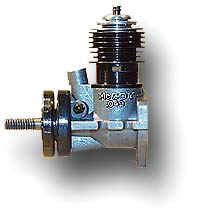 This engine was the first small engine design by Mel Anderson. The bypass ports are cut into the cylinder just below the exhaust ports and the transfer channels are formed by a hollow between the steel cylinder and the aluminum spacer ring. The fuel tank is attached to the back with a single screw. Production started in 1949 and special versions were produced for other companies like American Junior, Wen-Mac and Royal. 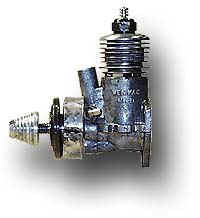 The complete cylinder assembly, from piston to head was also used in Roy Cox first powered race car, the Cox Special. 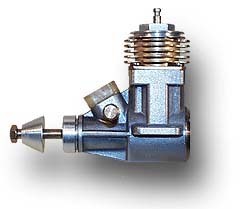 This is a ¼-A Cub engine with a reed valve and exhaust ports on both sides of the cylinder. By now I have restored it by adding the missing carburetor needle and spring. These engines did not run very well, I have been told, so I have added the matching flywheel available from OK engines. 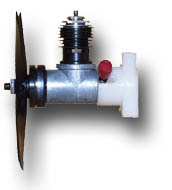 The engine is equipped with a knurled pulley starter spinner and a pressed in intake extension. Andersons blue book calls it a kit / semi-assembled engine. This engine has been assembled from 1950s NOS parts. 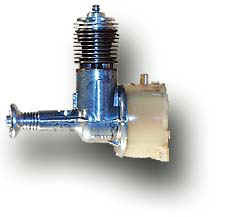 These are the remains of an old Cub engine with a reed valve. Two mounting lugs were broken from the tank. Since taking the photo, I have restored it to full glory, added the missing carburetor needle and replaced the fuel tank. The mold of the crankcase seems to be modified from the Cub .049 shown above. The base of the front carburetor is still visible. A very lightweight engine with pull cord starter. 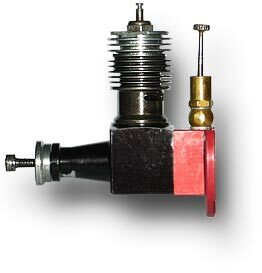 Instead of a special glow head, the engine uses a short thread standard glow plug. An aluminum cooling fin jacket is screwed onto the threaded steel cylinder. It is interesting to note, that the Wen-Macs were designed by Bill Atwood, who also designed the marvelous Tee Dee series for LeRoy Cox. 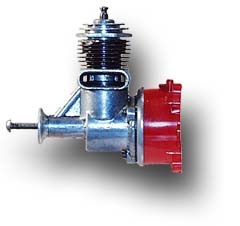 This engine has an encapsulated spring starter (rotomatic) and was also sold with a red glow head as the McCoy Red Head. In the 60's, Wen Mac produced about 6000 engines per day. Well, boys ... nice try, this stylish pot metal crankcase and this great looking fuel tank. 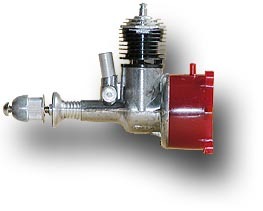 Cylinder, glow head and spring starter are nearly the same as on the 1978 McCoy .049 model. As I understand, these engines were produced by K&B for Aurora Plastics. Basically the same engine was also produced with a displacement of .061 cubic inch. I have no history for this engine. Mayve someone can help? This engine uses a nice cast crankcase and a steel cylinder. These cylinders were also used for a flat twin and a 5 cylinder radial. The G-Mark company also produced a larger .15 single and a .30 flat twin, again using some identical parts. All G-Mark engines were well designed, but probably too expensive to manufacture. I have flown this engine in a small Piper J-3 Cub. 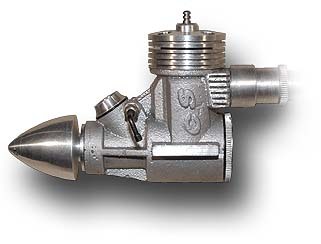 This smaller G-Mark engine is built from a bar stock crankcase and a steel cylinder. It is the smallest child of the G-Mark family and was nicknamed "hummingbird". The large plastic tank and the muffler made it a perfect engine for tiny models. I have been told, that the R/C carburetor worked quite well, bringing the engine down to idle at 4000 RPM. and to stop the engine for landing. There was also a sibling with a non R/C venturi carburetor. 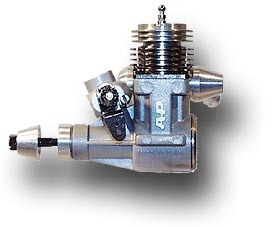 This engine has been distributed in the USA by Cannon R/C systems and in Germany by Hegi. This nice little engine had been developed by Hans Hörnlein in Germany. His well known “Taifun” Diesel engine series was produced in large numbers and distributed by Graupner. The “Foxie” was an attempt to extend the product range towards smaller engines. As Graupner was also the main distributor for Cox engines and models in Germany, he was not interested in selling this engine design. Therefore only a few prototypes have been built in 1960. Besides these prototype engines many parts for about 250 engines had already been manufactured, but not assembled. 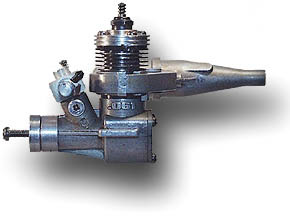 Similar to Cox engines, the engine was completely machined from bar stock material. 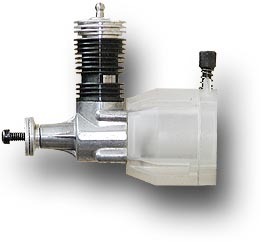 The crankcase has a triangular cross section and the tank/backplate assembly is held in place by 3 screws. 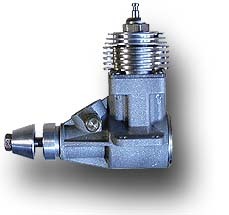 Contrary to Cox engines, the inlet is controlled by a rotary disc valve and the conrod is attached to the piston via a piston pin. The gas bypass passages in the cylinder are quite narrow. Between the years 2000 and 2006 Ronald Valentine, a friend and former supplier of Hans Hörnlein, assembled about 200 engines from this stock of old parts and some newly manufactured missing parts. These engines differ in some details from the initial prototype engines, but consists mostly of original Hörnlein parts. This engine is produced in small quantities by Peter Burford in Australia. Peter is the son of Gordon Burford, who is well known as the Australian "Engine Man". Many engines have been designed and manufactured by the Gordons - for example their "Taipan" engines and propellers are well known all over the world. Like his father, Peter is an excellent designer and machinist who developed the PB .033 diesel engine. The engine is intended for small free flight or R/C models, ideally suited for old timer events and leisure flying. For more details see www.peterburford.com.au.